Given India’s growing power and aspirations in world politics, there has been increasing interest among practitioners and scholars of international relations (IR) in how India views the world. This book offers the first systematic investigation of the world order models in India’s foreign policy discourse. By examining how the signifier ‘world order’ is endowed with meaning in the discourse, it moves beyond Western-centric IR and sheds light on how a state located outside the Western ‘core’ conceptualizes world order. 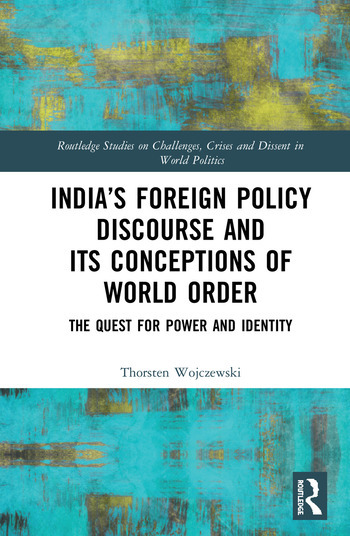 Drawing on poststructuralism and discourse theory, the book proposes a novel analytical framework for studying foreign policy discourses and understanding the changes and continuities in India’s post-cold war foreign policy. It shows that foreign policy and world order have been crucial sites for the (re)production of India’s identity by drawing a political frontier between the Self and a set of Others and placing India into a system of differences that constitutes ‘what India is’. This text will be of key interest to scholars and students of Indian foreign policy, foreign policy analysis, South Asian studies, IR and IR theory, international political thought and global order studies. Thorsten Wojczewski is a Teaching Fellow and Postdoctoral Researcher at the India Institute, King’s College London, UK.